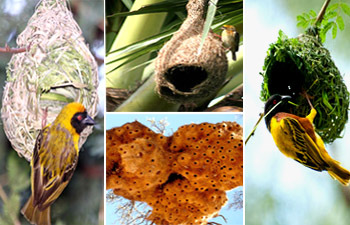 Weaver birds spend an incredible amount of time and energy building their elaborate nests but the results are worth it! 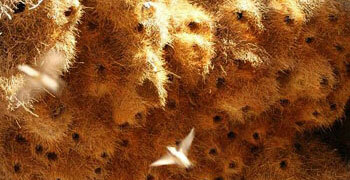 Weaver birds build nests which are so complex and intricate in design that humans find it difficult to emulate. 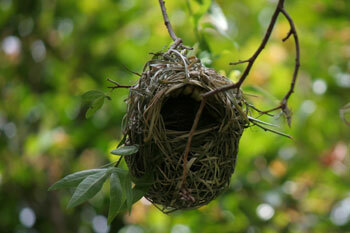 Each species of bird has its own way of constructing nests. Each technique requires a design planned in advance, to adapt to the environment. The complexity of design demonstrates the talent and skills of birds. Weaver birds make up a group of birds which are well–known for their roofed nests with elaborate interweaving of grass or leaf strips. Weaver birds resemble finches, particularly with their short, strong, conical bills. They feed on seeds, and other grain fields. They are social birds, usually nesting and feeding in colonies. A weaver bird is an architect, construction engineer and a site foreman - all rolled into one! Weaver birds use nests to protect eggs and nestlings from predators and adverse weather. The weaver birds are named after their nesting behavior ant it is amazing that a bird, using only its beak, can weave something so intricate and so consistent that one could never reproduce it with our hands. Weaver birds use nests to protect eggs and nestlings from predators and adverse weather. To minimize predation, birds may use or build nests that are inaccessible, hidden, or camouflaged. Nests may also help keep eggs and nestlings warm. Weaver birds prefer long grasses to build their nests preferably green, just before it ripens as it weaves better and when dried out is quite strong. They also know instinctively which materials to use, favoring fresh green blades of grass or strips of palm leaf. They use a variety of plant materials to build their nests, including strips of grass, leaves, twigs and roots. A weaver bird has a strong, conical beak, which it uses to cut blades of grass that it will use in nest–building. It can tie real knots in nest material with its beak and its feet. By tying knots, the bird makes the nest more secure. The nest of a weaver bird often has a narrow tube–like entrance that opens upside down. It is hard for a predator to get inside the nest. The weaver bird will often build its nest on a tree branch that hangs over the edges of a river. This also helps to protect the nest from predators. While all the weavers of the genus Ploceus are generally similar, there are subtle differences between the species – in appearance, in nest design and in social behavior. Practice makes perfect for nest-building weavers Weaver birds adding finishing touch to their nests. That weaver birds display marked variations in their approach to nest building, reveals that they learn from experience. Naturalists consider these nests to be the most astonishing structures built by birds. This species uses plant fibers and tall plant stems to weave themselves extremely solid nests. A weaver bird collects the basic building materials by cutting long strips from leaves or extract the midrib from a fresh green leaf. They choose fresh leaves as the veins of dry leaves would be stiff and brittle, too difficult to bend, while fresh ones make the work much easier. The weaver bird begins by tying the leaf fibers around the twig of a tree. The bird holds down one end of the strip against the twig with one end of its foot while taking the other end in its beak. It ties the fibers together with knots and slowly forms a circular shape that will become the entrance to the nest. 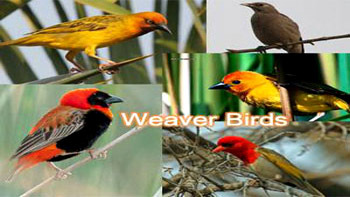 Weaver bird uses its beak to weave the other fibers together. During the weaving process, it calculates the required tension as the nest will collapse if it&apos;s too weak. The bird also needs to be able to visualize the finished structure, since while building the walls, it must determine where the structure needs to be widened. Diversity of nest designs Intricate nest designs developed by weaver birds. After finishing the weaving of entrance, it proceeds to weave the walls by hanging upside down and keeps on working from the inside of the structure. It will push one fiber under another and pull it along with its beak, until it accomplishes a stunning weaving project. Nest is done finally. It hangs from a tiny, swinging but strong twig, with an opening from the bottom part, which brings extra protection to the nest. The weaver bird won&apos;t just begin building its nest. It proceeds by calculating in advance what it needs to do next – first, collecting the most suitable building materials, then forming the entrance before going on to build the walls. It knows perfectly well where to thin or thicken the structure, and where to form a curve. Its behavior displays intelligence and skill, with no trace of inexperience. With no training, it can do two things at once – holding down one end of the fiber with its feet, while guiding the other end with its beak. None of its movements is coincidental; its every action is conscious and purposeful. Waterproof nests! Usually they build these structures in cavities under overhanging cliffs, to prevent rain from softening and thus destroying the nest. Masked weavers are named for their elaborately woven nests built of papyrus, grass, and twigs. They are round structures built hanging from a branch, with the entrance near the bottom. They look like funny fruit hanging from a tree. The male builds an intricate nest which the female then inspects; if it is up to the required standard she moves in, but if not she may pull it to pieces and make him start again, or else reject him in favor of someone with a better house. Male weaver birds construct their elaborate nests during mating season, using them to attract prospective mates. Sometimes, after the male has completed the basic structure of the nest and a female has approved it, the female will help him to complete the nest. She will line it with grass and feathers, and start raising a family. The male will then try to build a nest for another female. Some of the weaver birds build a solid, rainproof nest. These bird obtained the perfect mortar by gathering plant fibers from the environment and mixing them with its saliva, which gives the plant fibers both elasticity and makes them waterproof. They gather mud and feathers and transport them in their beaks to the construction site, where they mix mud with their saliva, smearing the mixture against the face of the cliff to form a pot-shaped structure with a round opening on top. They filled structure with grass, moss, and feathers. Weaver birds repeat this process until their nest is complete. Communal nests can accommodate even 400 birds! Sociable Weavers are best known for their giant communal nests, the largest built by any bird, which can house 400 birds and last 100 years! Another interesting example of nest building is performed by sociable weaver birds of southern Africa, which nest in a single huge, cooperatively built structure with separate entrances. With the ingenuity of accomplished architects, the sociable weaver constructs the largest and most spectacular of all communal bird nests which some times can accommodate even 400 birds. A communal nest can fill up an entire tree canopy and may last for 100 years. The enormous nest is divided into rooms for nesting, feeding and sleeping. Rooms in the center of the large nest retain heat, so the birds roost in them at night, when it is cold outside. During the day, they cool off in the outer rooms. The most interesting thing is, his family doesn&apos;t have to live in the dark, though they do not have electricity. Weaver bird is smart enough to get it done by fireflies. He catches fireflies, brings them in and sticks them to the walls of the nest, where they spend rest of their lives as light bulbs!